The following line graph shows the number of people (in thousand) who hired for 3 different department jobs during the five years period. 1. 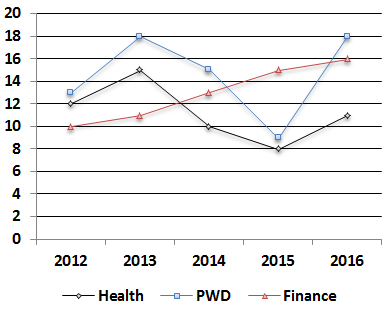 What is the ratio of the number of people who hired for PWD department in the year 2013 and 2014 together to the number of people who hired for Health department in the year 2015 and 2016 together? 2. Out of the total number of people who hired for the given three departments, in the year 2012, 68% were boys. How many girls hired for PWD in the same year? 3. The two departments that had less number of people in 2012, find the number of people in that department in last three years of given data? 4. If the total number of people in all the departments in the year 2015 was 2.5 lakhs, the total number of people who hired for the given three departments was approximately what per cent of the total people? 5. The total number of people who hired for Finance department in the year 2014 is approximately what per cent of the total number of people who hired for all the three departments in the same year? 6. 7 11 18 46 221 ? 7. 4 20 105 577.5 3320.625 ? 8. 299 320 323 308 275 ? Directions (11 – 15): In each of these questions, two equations (I) and (II) are given. You have to solve both the equations and give answer. Since we don’t know the number of boys hired for PWD, number of girls hired for PWD cannot be determined. 3. C) In 2012, the two departments that had less number of people were Health and Finance. Series I : 7 11 18 46 221 ? Sereis II : 4 7 28 175 ? Series III : 3 21 147 ? 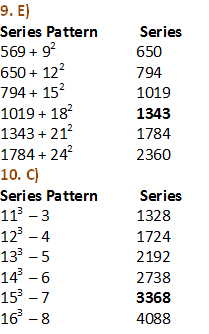 Clearly, the pattern in series IV is multiples of 7. ∴ missing term in series I = 221 + 1204 = 1425.